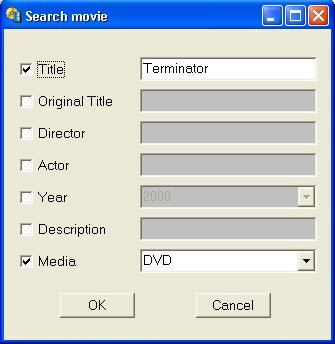 Easy to use movie database manager with ability to take screenshots from movies, can be used for cataloging your personal collection of DVDs, CDs, VHS tapes, etc ! Easy movie details import from online movie database IMDb.com. Demonstrative and handy vision of all your movie collection. Capturing stills directly from your movie DVDs or AVI files to the database. which can help you remember movie using your visual memory and evaluate quality of the movie's picture. Fast movie search by any of the database fields - Title, director, year, actors, genre, description, etc. Export your movie collection to HTML, plain text or Microsoft Excel format, so you can place it at your home webpage or import to some other software. Password protection of movie database. You can catalogize your adult movie collection and you child never open it. Easy to use loan manager. AT File Mole - Extracting icons, cursors, bitmaps from EXE. AutoImager - Batch image processing/conversion software. PicturePlayer - Create CD ROM slide shows with sound ! Picture Show - Multimedia Slide Show and Thumbnail Viewer ! PhotoCDuke - An easy-to-use CD burning application. Accessory Media Viewer - Media TIFF TGA JPEG Image Viewer. AVD Slide Show - View a sequence of images as a slide show. Image Explorer Pro - Imaging solution supporting 70+ formats. Iris Virtual Photo Album - Making skinnable virtual photo albums. IvanView - Powerful image viewer browser with extended capabilities! DVD Movie Maker - A powerful DVD Maker VCD Maker DVD Movie Maker to make vcd svcd dvd from a lots of media type, such as avi mpg mpeg wmv asf divx.